Hi! It's Melissa from Don't Let the Teacher Stay Up Late. We are rounding up third nine weeks here in Virginia while trying to catch up from three weeks of snow with only 6 instructional days spattered in between. Fortunately two of our final skills before review for fifth grade make for a perfect pairing: figurative language and poetry. I don't know why we haven't already structured our pacing guides to just teach them together, but our school has unofficially done this. Students really struggle with both skills, so I love being able to spend extra time in each to really hit it hard. Personally, I feel like the most important thing when teaching figurative language is that students can recognize it and begin to understand what it means. I do teach them the different types, and we go over definitions and examples, but I'm not too concerned if they have trouble naming it when they see it. 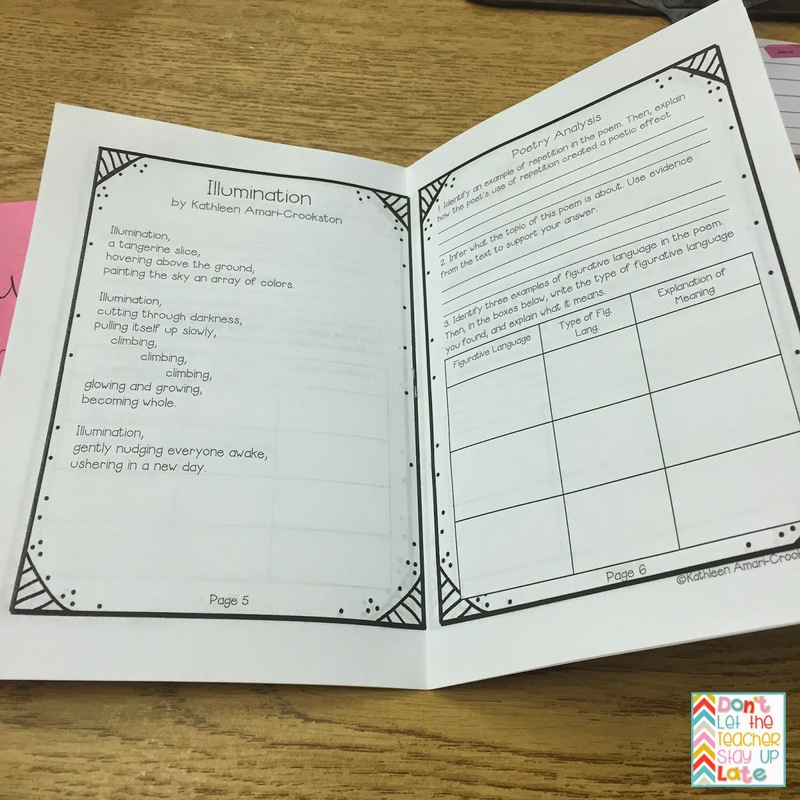 I did create a quick figurative language booklet (the pink book below) for my students to use as a reference. You can read about it on my blog here. 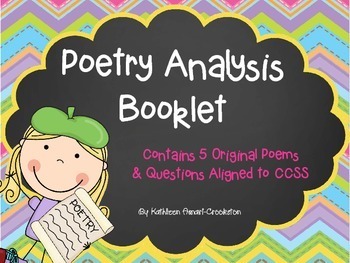 Really, though, that booklet was just to prepare them for poetry analysis. I found this gem last year from Middle Grades Maven and feel like it's one of the best resources I have bought. You can use any poem or song, though. I know Erin from I'm Lovin' Lit uses a lot of popular songs to teach it, and I think that's an awesome resource, too! 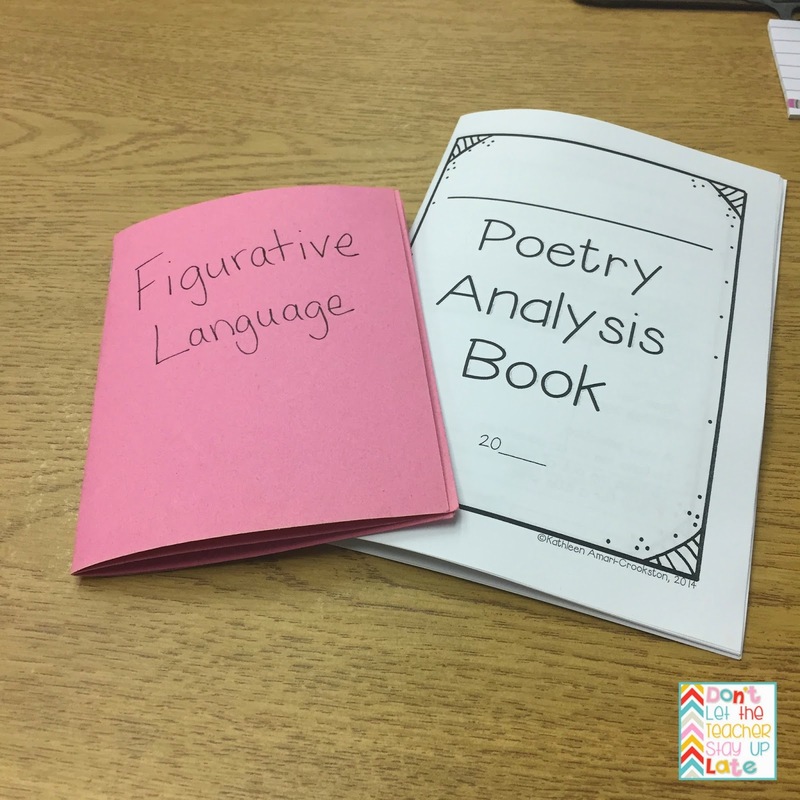 I like this resource because the poems are short and simple, but the students are then challenged to find different types of figurative language AND EXPLAIN WHAT IT MEANS! Don't miss that. I feel like some teachers will use poems or songs to have the students find the figurative language, but then they move on. What's the point in identifying it if they still don't understand why the author said it? We spend a lot of time discussing why those specific phrases were used, which also covers author's craft without the students realizing it. My favorite thing about this booklet, though, is that it helps relieve some of the anxiety my students tend to have when they see poetry. Poems are consistently tough when I look at test data, and I will do anything I can to try and help them along the way. After we have finished the booklets (we're a little behind because of the snow), I want to find some longer and more difficult poems for them to explain. It would also be fun to have students try to mimic some of these poems to create their own. Poetry month is just around the corner. The possibilities are endless! What plans do you have for poetry month?